MULTI-LAYER® is a technology, developed by S.I.I.T. Nutritional Division through which is possible, by a very unique tableting process, to manufacture tablets constituted by 2 or 3 layers. What when why triple layers tabletting technology for a more effective absorption of ingredients. Each layer assure a controlled release of ingredients to improve bioavailability. mostly related with the possibility of having time and/or pH-dependent layers in the same tablets. 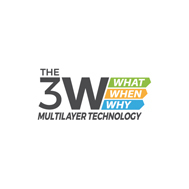 MULTI-LAYER® allows therefore to formulate products double or triple shooting actives, normally, slowly and/or quickly releasable. MULTI-LAYER® technology can be applied to finished product formulated as multi-layer tablets releasing actives. Each application of MULTI-LAYER® on finished products is branded and could be protected by patents issued or pending.